Audio book available at www.Audible.com. Forty years later, we’re still feeling the reverberations from Woodstock, the rock festival that shook the world and defined a generation. 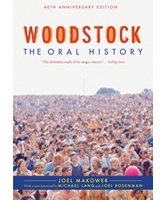 Woodstock: The Oral History, 40th Anniversary Edition is the definitive, electrifying account of this legendary concert. In 1969 four young men had a dream: to produce the greatest rock concert ever held. Little did they know how enormous a reality their dream would become. Woodstock is the fascinating story of how it all came together—and almost fell apart—told exclusively in the voices of the men and women who made it happen. In it, you’ll read about the adventures of a ragtag bunch of businessmen and bohemians, of hippies, hucksters, handymen, and hangers-on, working against all odds to unite a generation for one wild, glorious weekend in August 1969. You’ll get behind-the-scenes stories from David Crosby, Abbie Hoffman, Miriam Yasgur, Richie Havens, Wavy Gravy, Paul Kantner, Chip Monck, and a host of others. This special 40th anniversary edition features a new foreword by Michael Lang and Joel Rosenman, two of the original coproducers of Woodstock, as well as updated information on the people who made the music festival happen. Whether you were at the festival or not, Woodstock will make you feel as if you were by transporting you back to a time when anything was possible and 500,000 people gathered in a small town in upstate New York to prove it. Joel Makower is Executive Editor of GreenBiz.com and a veteran writer and speaker on green business and clean technology. He is the author of more than a dozen books, including Strategies for the Green Economy: Opportunities and Challenges in the New World of Business and The Green Consumer.